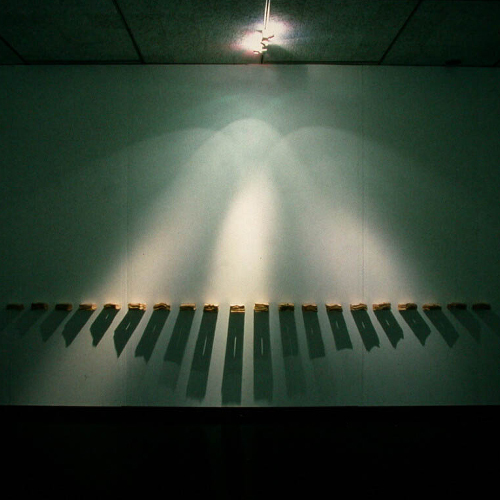 Created in 1996, this piece, entitled Empyreal Cadence, features twenty wall-mounted multifired ceramic units arranged in a line at waist-height. "... with bright overhead lights streaming down upon them. This creates a large phoenix-like immaterial sculpture of light." Conceived as a drawing in light and shadow, the reflected light effects, and the absence of implied vessel-forms are seen as tools in an ongoing re-examination of both the function and the functionality of sculptural ceramic objects. Collection: the Winnipeg Art Gallery Permanent Collection.